What Happens at the Gas Station, Stays at the Gas Station | HAIL DUBYUS! Yes, folks, remember the Iraq war? The one that was supposed to pay for itself with oil revenues and guarantee the American people cheap oil for the next generation? 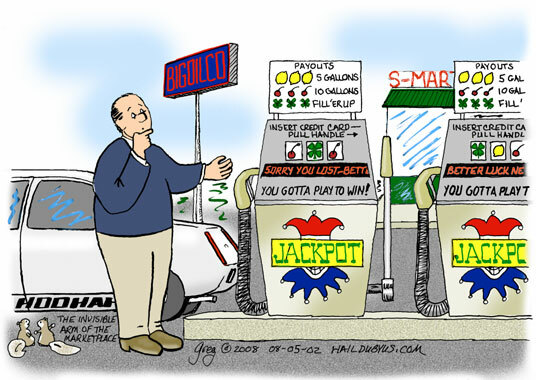 Well, we’re going to hit $4 per gallon this summer–despite the fact that gasoline demand is DOWN–and the oil companies are still making obscene profits while housing, industry and banking are tanking. And to add insult to injury, they’ve got their fingers on the pump because of defective valves and people are being charged extra per fill-up. And is anybody doing anything about that? Hell, no, it’s illegal but there’s no regulation! Welcome to the country of the corporations, by the corporations and FOR the corporations. As long as they’re petroleum. Which shall not perish from this earth–until the oil runs out.